At the November District 1 meeting I met Department VFW Commander Linda Fairbank and received one of her pins. I also met Department President Ruth Lamoureux and Department Junior Vice President Marjorie Stetson. All the Auxiliaries were thanked for all the hard work we’ve done this year. Membership goals were discussed and we were told that we will be getting a new auxiliary in the district very soon! We contributed 10 hygiene kits for homeless veterans to District President Mary Davenport along with some other auxiliaries. We also gave some extra supplies that could be used in making more kits. 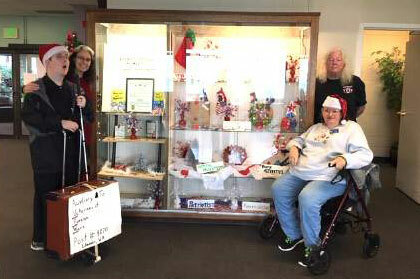 We have set up our display in the lobby of Edmonds Senior Center. Come by, take a look, and let me know your thoughts about it. You can call me at 206-853-5673, or send me an email at val4erie9@gmail.com. We are always happy to welcome new members to the Edmonds Auxiliary to VFW Post 8870. If you are interested in joining us, give a call or send an email to Valerie at the phone number or email address above. Merry Christmas and a Happy and Blessed New Year to you all! We look forward to seeing everyone at our January meeting!